SERRA is a 50+ year-old volunteer residents’ organization committed to promoting the interests of our neighbourhood with a focus on community, neighbourhood character, quality of life, stability and safety. Among our major activities are real estate overdevelopment, municipal planning and zoning, construction, green initiatives and safety. We are completely funded by memberships and donations! Mark your calendars! @SERRAtoronto 's AGM is coming up soon. Tuesday, April 30. Doors open at 6. Guest speakers with important updates include @JayeRobinson , @JoshMatlow and TDSB Trustee @shelleylaskin .Hope to see you there! Read about the Midtown in Focus planning guideline (intended to be used for managing growth and development in our area) by going to the City of Toronto website and searching Midtown in Focus. Click here to read more. 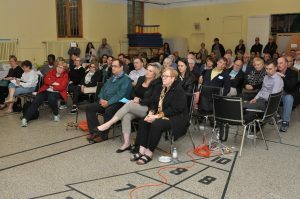 The City of Toronto community consultation on Monday. May 6, 2019 at 6:30 p.m. (at Greenwood School) for the planning application at 1408-1420 Bayview Ave. Click here for more details. Read the notice here. SERRA is involved in a growing number of community initiatives. In addition to our work in development, both high rise and residential, we have new working groups that need support. Specifically, we are looking for volunteers to help with: green/environmental issues; construction matters; heritage. Get involved! Contact us today. Join our new SERRA Facebook Group and join the conversation. SERRA volunteers are committed to making a difference for the Davisville Village and South Eglinton neighbourhood.